As told to Mhairi McLaughlin and Tegan Smyth. Words by Mhairi McLaughlin. What is life like for your kids in Hong Kong? Nino: We need more support for the children. For kindergarten, the government pays the school fees but not the books, uniform, shoes etc. Because refugees aren’t allowed to work, they can’t provide these basic things for their kids. In primary school, refugees manage to get some support but it’s not enough. I want to be able to buy a computer for my kid so that he can do his school work at home. Before, the government was paying half of the school fees. Because of Vision First, the government is now paying the full fees. It is important that everyone in Hong Kong knows how refugees are living in Hong Kong, and the problems they are facing, so that something can be done to help. The media are useless – bar the alternative [non-mainstream] publications, the government has done all it can to stop the real stories being published. Photo: Denis Tsoi. 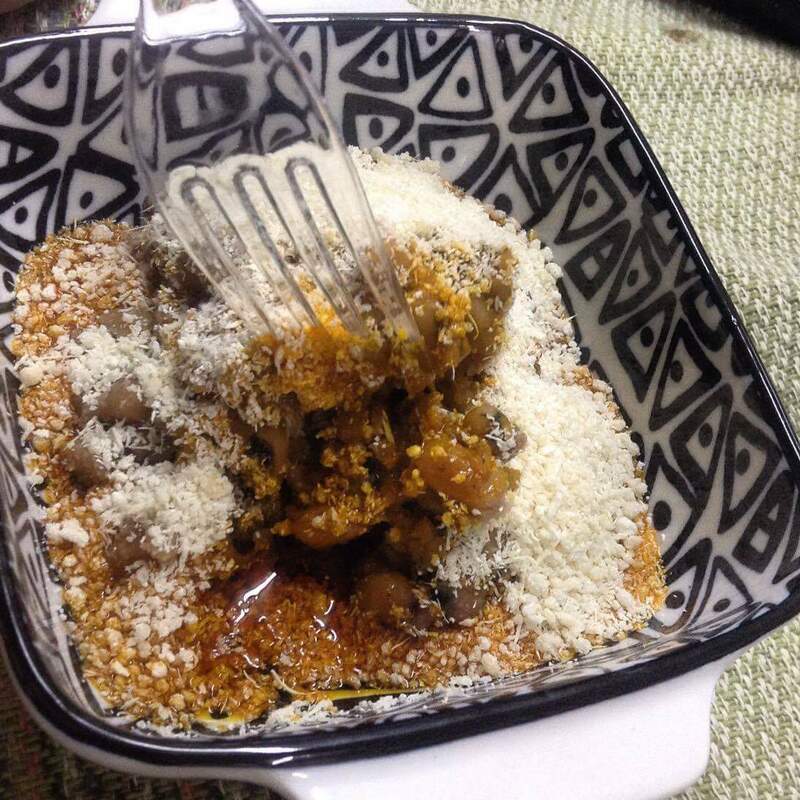 Close up of Veyi, a Togolese dish made from beans and cassava flour. How did you first get involved in Vision First and Refugee Union? I first met the people at Vision First in 2009, and decided to join them to help fight the system. You do a lot of organising, in the past were you a teacher or a social worker? You are really involved with RU. I’m not a politician, I was a simple guy who helped with the family property business. My grandparents used their own minds to set up a business and I followed them. When I came to Hong Kong in 2005, we didn’t have accommodation. We slept for 7 months on the Star Ferry Pier; we had to hide ourselves from midnight to 6am because if the police found us they would tell us to leave because we weren’t allowed to sleep there. Since 1967, the same political party has been in power in Togo, is this why most people have left? My younger brother was a student leader campaigning for rights. In 2005 there was an election in our country and the police..they were the ones with control over the army, they took power from the ones who had won this election. The students came out and protested for 45 days. As my brother was one of the leaders (there were five in total), one night these students leaders were all taken away. I wanted to find out what happened to my brother. My mother, at the time, was also worried and was asking me and pushing me so I needed to find out what had happened to my brother. I just walked out for five minutes and saw a car driving out of my property. I came back and I could see my wife. They had beat her. She was two months pregnant at the time and lost the baby. So you see how bad it was. But even now, the same people are in power. Nothing has changed. Sometimes this all makes me feel bad, especially seeing all this anti refugee propaganda from the government. I’ve seen it all myself before – they don’t know what’s going on. When did things start getting better? Is your life better now? Mark Daly, a human rights lawyer in Hong Kong, fought with the immigration department until taking the case to the media. In June 2006 the government started giving refugees accommodation. At that time they got HKD1000 for rent, HKD900 per month for food, and HKD10 for transportation. We also receive food coupons which we can use at Park N Shop and Wellcome. This is great but the food is very expensive so this does not seem like the best solution. Note from the writer: We apologise if some of the content featured in this article has been distressing. But it is important that you read it. Nino believes the Hong Kong immigration department uses refuges to make money for themselves. That these people are useless because the work they do to improve the quality of life of the refugees is completely disproportionate to their salary. They are pushing papers around, not knowing what it is to be a refugee with no money, yet at the end of the day they get paid and can go home to their families with food and a bed. Hong Kong immigration is creating separate departments to handle the cases of refugees because the justice system is so heavily influenced by politics. There is a continuous cycle of cases being rejected and refugees going back to appeal through hearings.